While watching drama and musicals is becoming more and more fashionable in China, Peking Opera is still seen as a pastime for the elderly. At over 200 years old, Peking Opera may indeed be like an elderly person who loves to espouse their wisdom. The theme of thousands of Peking Opera repertoires can be summed up in one line: encouraging good behaviour. However, Peking Opera’s age doesn’t mean that it is outdated. Peking Opera is actually on the cutting-edge of theatre and had a profound impact on western drama 70 years ago. Suki Li explains. Peking Opera is neither from Beijing nor is the kind of “opera” that we usually refer to. To understand this we need to go back to the Qing Dynasty when Qianlong was emperor. This was one of the apogees of Chinese history; people enjoyed economic prosperity, peace and cultural development. 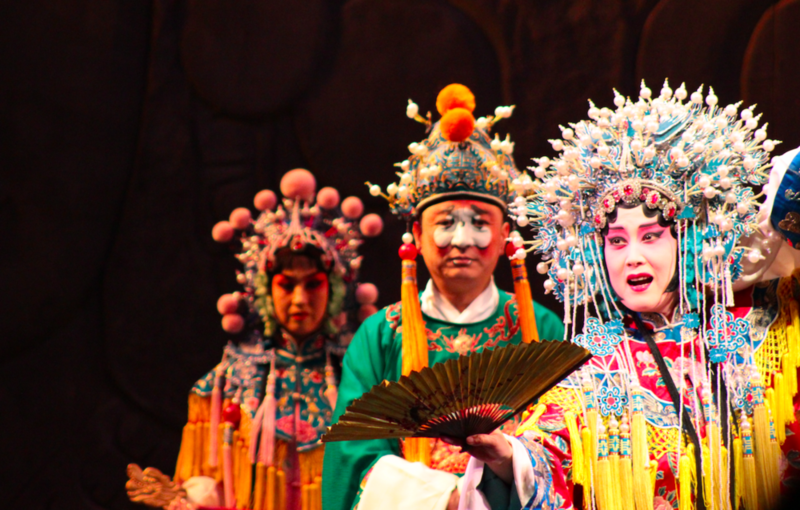 Apart from Kunqu Opera, many contemporary local operas were prevalent in Beijing including Jingqiang (local Beijing opera), Shaanxi Opera, Yiyangqiang (Jiangxiopera) and Hanju (Hubei opera). Amongst these opera styles, only Kunqu Opera was classified as ya (standard and elegant), while all the others were classified as hua ( oral), implying they were vulgar and incomparable with Kunqu. However, few people could appreciate Kunquand the oral styles were more popular as they were more down-to-earth. In 1790, an important event in the history of theatre occurred; Anhui troupes performed in Beijing. In that year, preparations began for grand celebrations marking Emperor Qianlong’s 80th birthday. An Anhui opera troupe, known as the Sanqing Troupe, took part in the birthday performance in Beijing and was Emperor Qianlong’s favourite. Seeing that the Sanqing Troupe had achieved such great success in Beijing, other Anhui troupes soon flocked to Beijing. Among them the Sixi, Hechun and Chuntai Troupeswere most famous. Together with the Sanqing Troupe they were referred to collectively as the “Four Major Anhui Opera Troupes”. Peking Opera thus is a performing art that assimilated the merits of Anhui Opera and other local operas in Beijing. Peking Opera is not sung and spoken in a Beijing accent, rather it uses the Huguang accent that originates from Auhui and Hubei. Peking Opera has distinct roles. They can be divided into four archetypes known as Hangdang: sheng (male roles), dan (female roles), jing (painted-face male roles), and chou (‘ugly’ roles) based on the character’s gender, personality, age, occupation and social status. Peking Opera now has a repertoire of over 1,000 works with innumerable characters. All these characters fall into the above-mentioned four categories, each of which can be divided into subtypes. 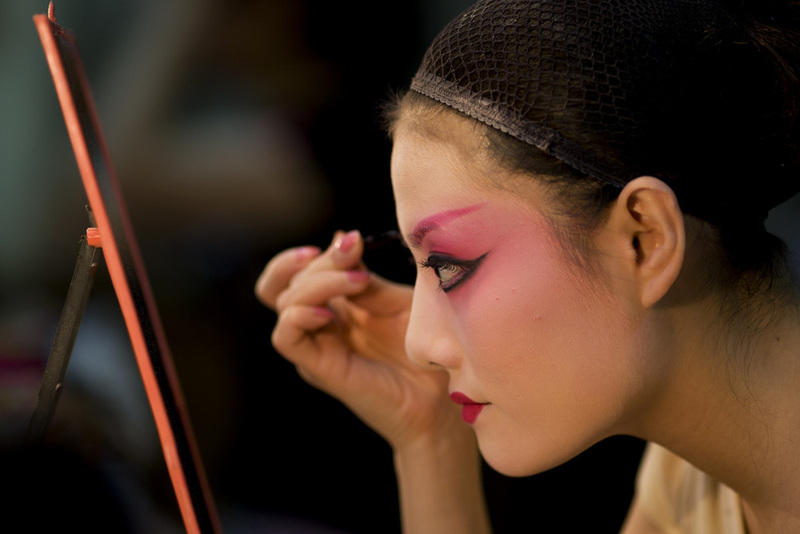 Of all the Peking Opera roles, female roles were the least common. However, they are better known than any other category. Dan is the Chinese name for female roles, which include “blue-gowned female roles” (qing yi), vivacious female roles (hua dan), old female roles (lao dan), martial female roles (wu dan),”female general” roles (dao ma dan),”coloured-dress” female roles (hua shan – roles more lively than “blue-gowned female roles” but more demure than “vivacious female roles”). Among these, the female roles performed by male actors (nandan) drew the most attention. 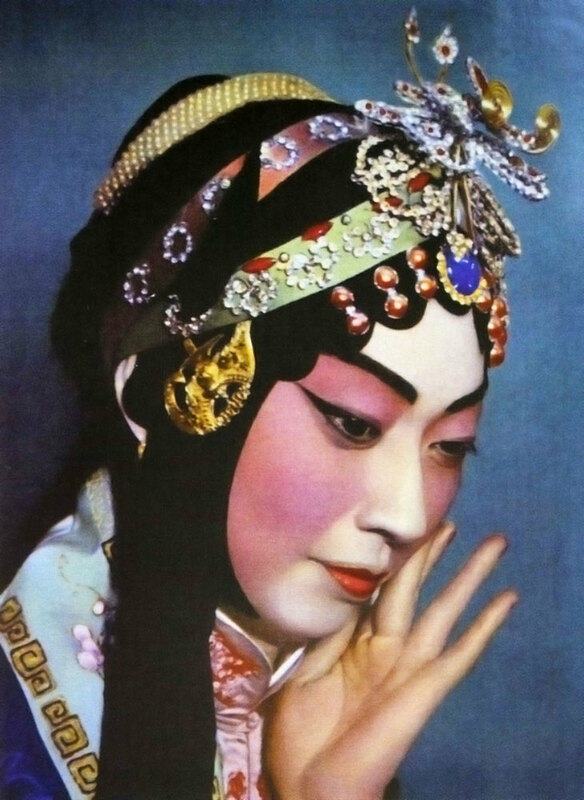 Peking Opera was originally exclusively a man’s world, in terms of both artists and the audience. However, a good story always includes female figures, so some actors needed to play female roles. The troupe would pick young boys with female characteristics and train them to imitate women’s smiles and behaviour. Later, when society became less conservative, actresses and female audiences were allowed in the theatre (at first, however, women were not allowed to sit with men; there was a special section for women). Although there have been kun dan (actresses playing female roles), the “Four Renowned Dan Characters” of the past century –Mei Lanfang, Shang Xiaoyun, Xun Huisheng and Cheng Yanqiu – were all men. Although there are many actors and actresses playing female roles today, none have been able to match the four titans of Peking Opera that proceeded them. It is hard to imagine what Peking Opera would be like without Mei, Shang, Xun and Cheng. In 1919, Mei Lanfang led a troupe to Japan and put on a show there. That was the first step in promoting the art of Peking Opera abroad. Later, Mei led a tour to the United States and Europe and achieved great success. It was because of his efforts that many Western people learned about and fell in love with this ancient art rooted in the soil of Oriental culture. 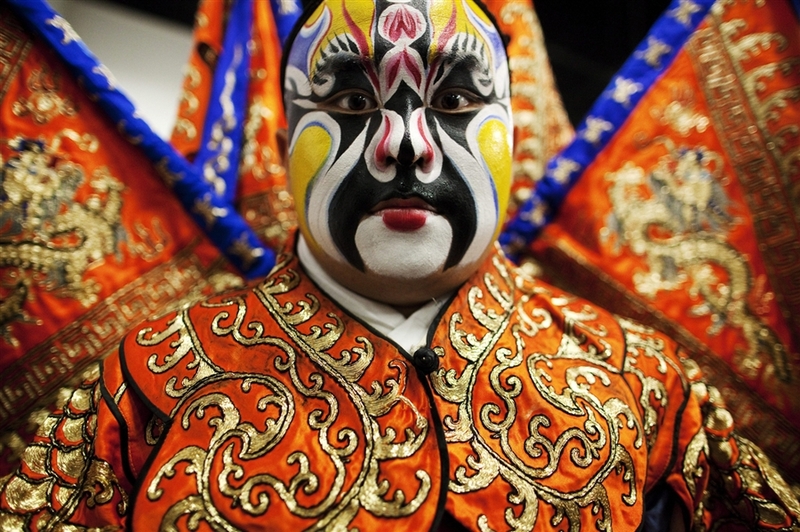 How did Peking Opera capture the hearts of Western audiences? Apart from its unique singing style, the “modern” performing method was also a significant factor. Take “A Junction of Three Roads” (Sanchakou) as an example. One plot included a martial male role (wu sheng) who entered an inn where the innkeeper came to him with a candle. The candle signified that it was nighttime. The innkeeper left, wu sheng looked around with his candle and extinguished it when he had made sure that he was safe. The innkeeper then came in and approached him with a knife, as softly as possible, to show the dead of night. The innkeeper and wu sheng searched for each other in the “dark”. Their cautious movements implied that the room was pitch black, even though they were on a bright stage. They were so close, but could not see eachother. It was the actors’ facial expressions and actions that explained the context of the scene. These “advanced” performing methods not only impressed many foreign audiences, but also influenced many Western plays.